Going with the flow, euronews discovers the link between rivers and global warming, with the focus on Africa. “In this programme, we join a research expedition between the Zimbabwe and Zambia border. In many ways, the rivers on the African continent remain a mystery. 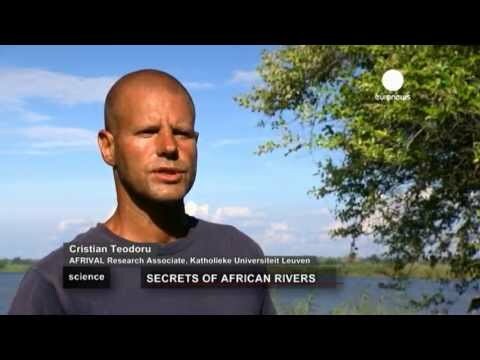 Today, European scientists join forces with their African colleagues in search of answers on the role played by African rivers in the global climate,” says euronews science producer Denis Loctier. Rivers naturally produce greenhouse gases (CO2, CH4, N2O), that contribute to global warming. Land use and vegetation patterns along the riverside influence river biochemistry. An international research project aims to improve our understanding of how the rivers in Africa work. Euronews spoke first with Cristian Teodoru, a Research Associate for AFRIVAL in Belgium. He said: “We’re on the Zambezi river, the fourth largest river in Africa, and the largest river flowing into the Indian ocean. And this is our study site”. Unlike the European fluvial systems that are relatively well researched, rivers in Africa have so far been poorly studied. A greater understanding would help countries like Zambia manage its water resources, responding more efficiently to growing demand. Scientists measure various water parameters, including its temperature, oxygen, pH, conductivity, and different carbon pools. This data will explain what portion of the carbon entering the river from the surrounding landscape with decomposed organic matter or soil minerals gets converted into gas or trapped into sediment, and how much is ultimately reaching the ocean. “At this point, everything is more or less unknown. This is why we are here. We’re trying to look at the transport of carbon into the ocean, to the sedimentation processes, fluxes to the atmosphere. We’re looking at the source of carbon – we try to understand how much carbon in this river is terrestrial, how much is aquatic-produced,” said Christian Teodoru. When the series of measurements on the Zambezi river are complete, Cristian will return to his home university in Leuven, Belgium. By that time his assistant Frank C. Nyoni, a masters student at the University of Zambia, will have learned all the methods used. That will ensure that the research can continue after this project is officially over. The water samples collected in Zambia are being sent to laboratories in Europe for more detailed analysis. Similar field studies also take place in Kenya, Mozambique, Niger, Gabon, Madagascar and the Congo River basin. Measurements are taken at regular intervals along the whole length of Africa’s main rivers. “We expect that the geochemical parameters, including carbon dioxide and oxygen, might change along the river stretch, influenced by landscape, by the hydrology. This is why we continue sampling the river downstream, down to the Indian ocean, the large number of sampling sites,” added Cristian. Studying the secrets of African rivers will shed new light on biochemical mechanisms shaping our global climate, helping to secure a safer future for the people on the continent.